This is a inner segment link of the GNR website covering the exaggerated plane crash claims. Outlined below are just a few added facts not cited in Part 4 on the GNR web site. Within just two weeks of the 1984 Templeton/Gardner Massachusetts plane crash that psychic Noreen Renier claims to have found, three single-engine planes crashed within approximately 35 miles of one another. Six days before the Gardner crash, a second plane had crashed approximately 11 miles further south near Barre, Massachusetts. And within a week following the Gardner crash a third plane crashed approximately 24 miles north, near Monadnock Mountain, New Hampshire. Monadnock Mountain is known as the most climbed mountain in the world. Both of these crashes south and north of Gardner were near mountainous terrain, rock slabs, and gorges. And both crashed on elevated mountainous terrain and both before the "Gardner" crash was found. 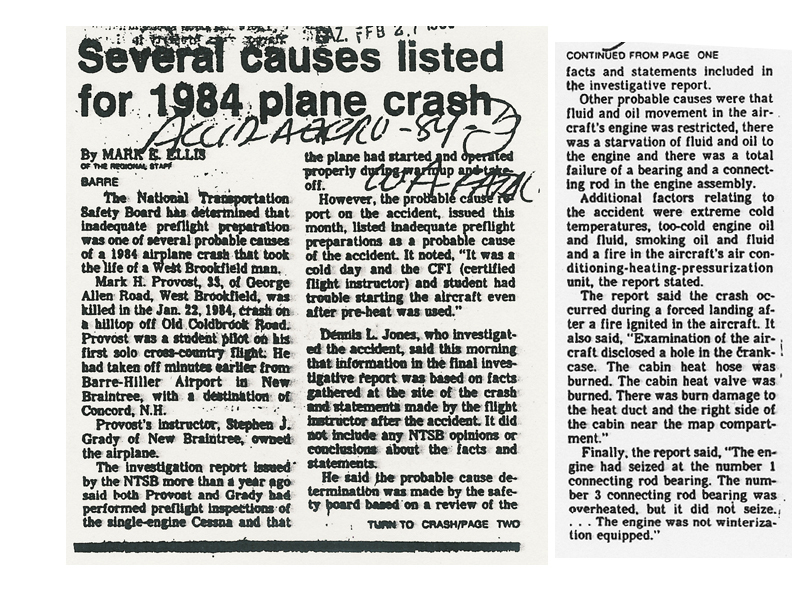 Anyone searching though the media in 1984 (years before rapid internet use) for information about an airplane crash (rather than using paranormal psychic abilities to conduct a missing person psychic search) might have easily become confused and naturally assumed only one crash had occurred. Did Noreen Renier attempt to collect "easy" non-paranormal clues about the crash and actually completely and literally miss the target? The Gardner airport actually stands on land in both the city of Gardner and also the city of Templeton. The plane crashed on the southern Templeton end. The National Transportation Safety Board number was NTSB NYC84FA085 covering plane N55495 which crashed on January 28, 1984. Merrell notes, “In sorting through the confusion even as late as July 2006 additional reports were located. Three crashes is unusual but remember the local weather in late January and early February 1984 was very poor. I accidentally passed on several news clippings to Gary Posner years ago that I thought covered only the crash near Gardner, but have recently discovered one pertained to the crash near Barre. While local officials in Gardner had acrash report and witnesses, for others outside the state there was some confusion. But this should not have affected a psychic who claims to have sensed the crash scene with Arthur Herbert immediately in her book A Mind For Murder. Yet someone attempting to provide information in haste using reports from newspapers or local Civil Air Patrol reports might have erred. They could have easily used info about the wrong crash without knowing it was wrong at the time. It's certainly plausible this was done. Remember Renier writes that she met Jessica Herbert the next afternoon after Jessica's phone call. That gave Renier just about 30 hours to prepare and --- if she wasn't using just her alleged psychic powers --- get information about the crash fast. We don't know if Renier used something beyond her "psychic" senses. We only know the facts she presented don't match the reality of the crash near the Gardner Massachusetts airport, and her claims were wildly wrong. In fact as noted in virtually Renier's entire story about the crash and its events lacks credibility. We do know however in the 2005 edition of A Mind For Murder Renier claims she saw the letters H, D and A representing nearby towns near the N55495 plane which crashed in Templeton Massachusetts. Yet the terrain near either of the other crash sites much more closely resembles the terrain described by Renier in the 2005 edition of A Mind for Murder --- including gorges, rocks, hills, and mountains. In addition, if one examines a map of the area you can draw a virtually straight line from east to west from Hubbardston to Dana Center to Amherst for the Barre crash. This puts you in line toward Quabbin Reservoir. And while the spread of the three, (Hubbardston, Dana Center, and Amherst) is wide and not on a heading toward Concord [New Hampshire], all three are in Massachusetts. And they would at least match areas in Massachusetts and have first letters beginning with H, D and A. And for the crash near the Monadnock area there is the Ashuelot River, Dublin and Hadley. Less likely, but still adding to the confusion. There is no proof that Renier provided longitude and latitude near any of these three crash sites. And there are thousands of possible matches using the letters H, D and A. But interestingly the plane crash near Barre was heading toward Concord, New Hampshire. And the plane crash near Monadnock was already in New Hampshire. Renier wrote the plane carrying Arthur Herbert "mysteriously vanished from the sky somewhere over rural Massachusetts or New Hampshire." Why did she believe New Hampshire was connected with the plane carrying Arthur Herbert when she claims to have seen the plane "immediately"? 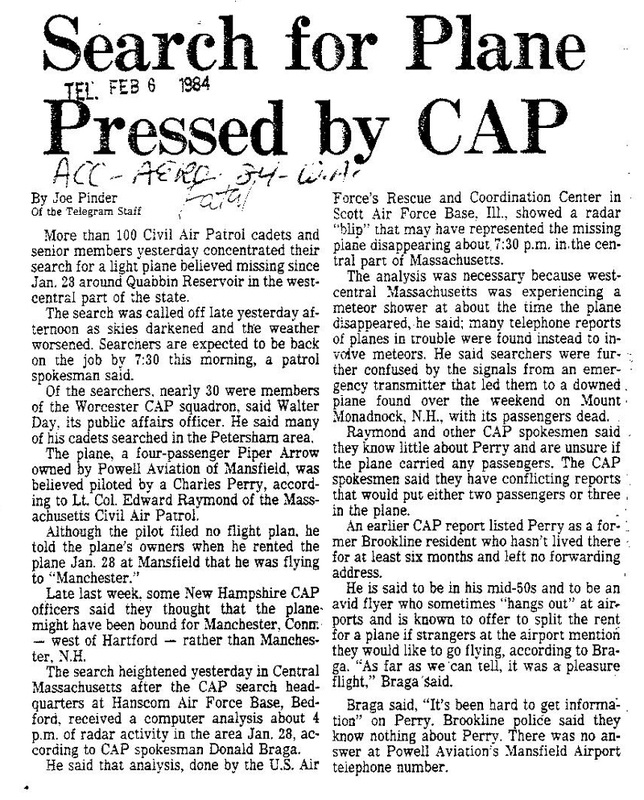 When the Civil Air Patrol expanded its search for the missing "Gardner" plane it was conducted in western Massachusetts according to the second newspaper article shown below. And most of the extended searches conducted 10-15 miles west of the Gardner airport clearly show that air search teams were not circling the Wilber's home or the Gardner airport, but flying near Quabbin Reservoir. The concentration of air searches were not circling just 2700 feet off the Gardner Municipal Airport southern runway. And a search using two Air Force planes focused on the swamp area southwest of the airport on February 10th was only 6 hours --- and revealed nothing. Merrell notes, "Even around the swamp they were looking for broken tree branches and parts of an airplane. As there were no trees for the first 2000 feet off the runway, the area immediately above the crash site was very quickly covered within minutes. No lengthy circling of planes above the crash site occurred that led the Wilber's to the area by looking at the planes overhead." Portions of the psychic claims from Renier may fit --- but more so for the wrong planes, the wrong crashes, and the wrong sites. If one assumes Renier acquired her information from conventional non-psychic means --- through the media and examining maps --- she missed the actual location of the real crash by simple human error and confusion. This explanation may explain her selection of the letters "HDA" --- possibly correct letters, but matching the wrong air plane crash. In the latest 2008 revision of A Mind For Murder Renier incredibly switched her claim of seeing the letters HDA to GTO. Much more at the www.globalnetresearch.com. If you can not read this article below, please click the article for a larger image.